Is this a rare picture of the Loch Ness Monster on land? Also, World Exclusive - The sounds of Nessie, the Loch Ness Monster - click here to listen! 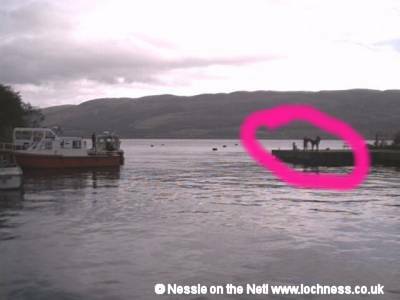 If this is Nessie, she has come ashore right by the boats at Temple Pier, Loch Ness. "This could be an absolutely amazing photo of the Loch Ness monster", said Professor Kettle PhD who is currently heading up a research project investigating sulphur vents beneath Loch Ness. Back to Nessie on the Net!